While it may come as much of a surprise to you as it did for Siren, I’ve now listed my 2014 Marathon coach for sale. A video that explains why I’m selling and shows the interior, is located near the end of this post. The honest answer is that I have quite a few new projects on my plate that will occupy my calendar over the next 12 months or so and I simply won’t have the recreational time to use my bus. 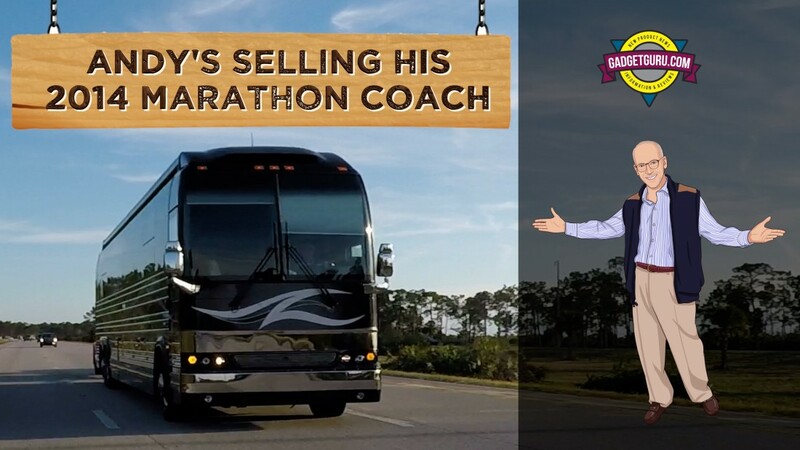 Since I’m one who believes that the best way to keep any vehicle, especially one of this magnitude, in tip-top shape is to use it, I thought it best to find a new owner for my 2014 Marathon coach. I’m not one who believes it’s a good idea to let a vehicle sit in a garage and collect dust. As you’ve seen in various videos, along with Siren, we’ve taken some memorable cross country trips on this bus and have visited a variety of locations. 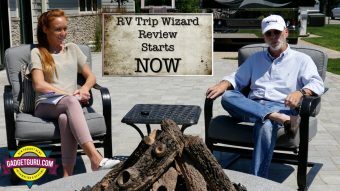 We’ve experienced dry camping in parking lots, visited scenic county campgrounds and had some wonderful extended stays at various luxurious motorcoach resorts across the country. I’ll add, that when not on the road, my bus resides in an individual concrete storage garage and is connected to 50amp power. I’ve never had to wait more than a day for factory service and that’s part of what makes ownership a pleasurable experience. 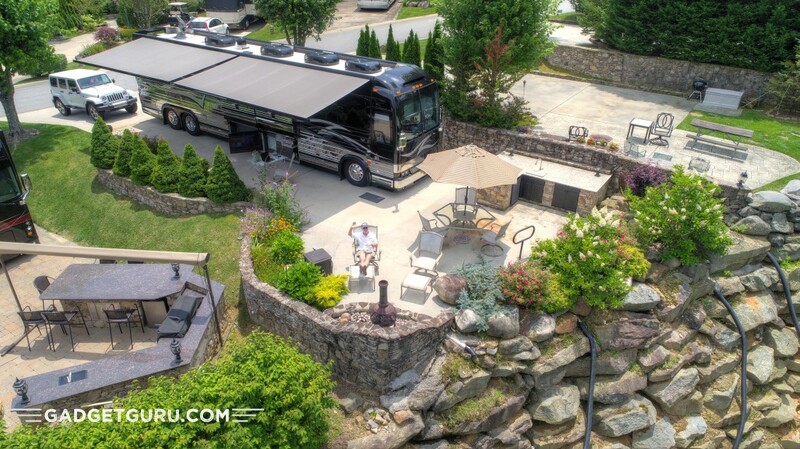 Other than a smooth, squeak-free ride, one of the best aspects of Prevost ownership has to do with the availability of service and scheduled maintenance. 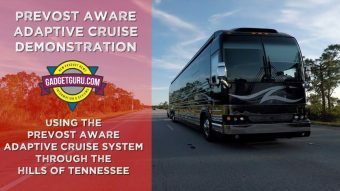 Obtaining service at one of the many Prevost factory service locations has been nothing but a quick and pleasurable experience and the tech’s I’ve met are experienced and get things done right the first time. That’s something I brag about to my Class A motorhome-owning friends who many times have to wait months to get something as simple as an oil change. I’ve never had to wait more than a day for factory service and that’s part of what makes ownership a pleasurable experience. Allow me to be clear, it’s not my intention to stop motorhoming as it’s an activity I truly enjoy. 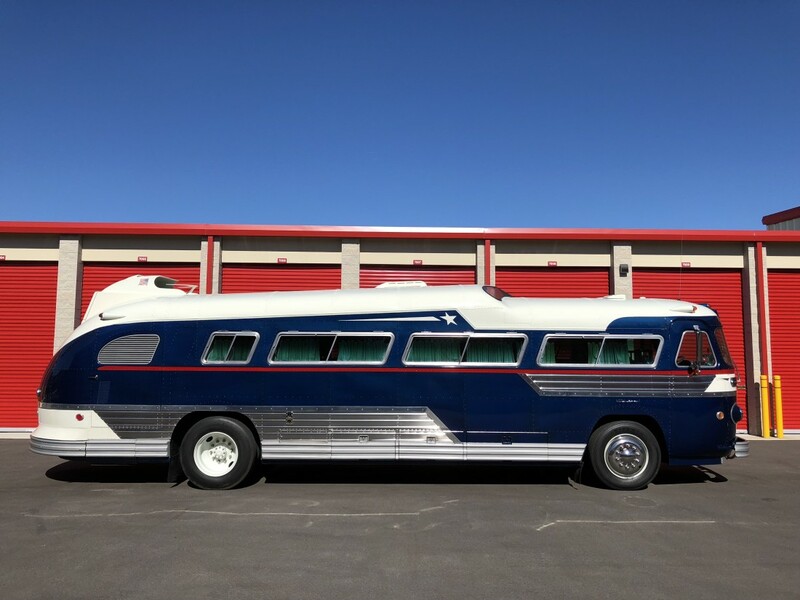 While I have my 1957 Flxible Starliner to use on occasion, I hope to begin the process of shopping for new luxury coach in the near future and that search will commence at the 2019 Prevost Expo in West Palm Beach in February. If all goes as planned, I’ll travel to the Expo in the Flxible. While I haven’t made the decision whether or not to go with a pre-owned unit or possibly, to build a custom coach, I’ll look forward to meeting with various converters and learning more about what differentiates one from another. Of course I hope to share my findings with you. 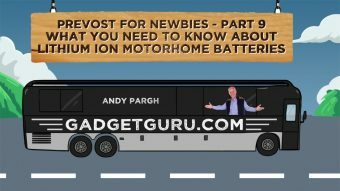 Here’s the video that will tell you more and give you a peek inside my bus. 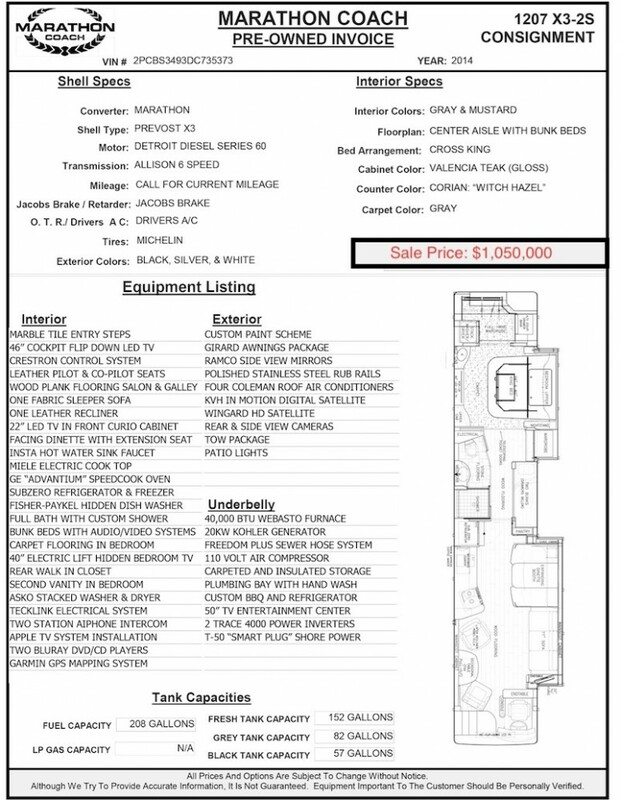 Here’s an image of the specifications sheet when I purchased the bus in March 2017. The price has been updated to reflect the current sales price. Note that additional modifications include the adjustable “Happy Jack” bunk, a new cabinet in the master bedroom, the replacement of one of the Blu-Ray players with a Tivo OTA tuner and of course new tires and batteries in March 2017. Last month, I replaced the front shocks and of course, this work was performed by Prevost at their new, state of the art service facility in Orlando. Ongoing factory maintenance was performed to keep things running smoothly and up to date. A video of the “Happy Jack” bunk can be found here. If you’re interested in purchasing my bus, contact Preston Green at Marathon Coach in San Antonio, Florida for a detailed walkthrough. Preston can be reached at prestong@marathoncoach.com or by calling (800) 437-8295.